Four of Jan Brett’s bestsellers together in a gorgeous treasury. 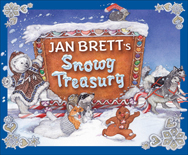 Jan Brett’s fans count her “snowy” books set in irresistible winter landscapes among their favorites. Now they can own a beautiful edition containing four of her bestselling titles: Gingerbread Baby, The Mitten, The Hat and The Three Snow Bears, set in Switzerland, the Ukraine, Denmark and the Arctic, respectively. Memorable characters, such as the mischievous Gingerbread Baby, the woodland animals in Nicki’s white mitten, Hedgie and the farm animals, and the three polar bears and an Inuit “Goldilocks,” star in picture books perfect for sharing and reading aloud. A beautiful gift for the holidays and beyond.